Since turning 40 last year, I have been dealing with more muscle stiffness, especially in my knees. When I slightly bend my knees (such as when I go to serve) or running around the court, I have pain and while it's not unbearable, it's not comfortable either. Because of this, I feel like I'm losing some power on my serve and I also feel less confident moving around the court, and have trouble bending down on my volleys. I don't think I injured my knee, it's just stiff everytime I go out on the court. It seems to slightly improve as I play, but never completely goes away. Any advice? Should I take some ibuprofin before a match? Natural remedies? My rectus femorus gets tight and short despite years of tennis. Some stretches could be stressful for some backs. Research safety for yourself including this one. There are many long threads here on knee pain. Search TW with above box: Patellofemoral pain. and other pictures until you locate your pain. Don't mask pain with medications and stress your injury. Great illustrations of common posture problems with discussions. Lots of options to look at, my main goal right now is to give my knees a break by dropping 10 to 20 lbs. Let me know if you find a knee band/brace that is comfortable & works... I think that is my next step. My pain is right on the front of the knee cap, where the patella is. It isn't bad if go down to the squatting position. But when I slightly bend my knee, it is hard to stay in that position. Report on pain in the front of the knee. Table 2 lists some possible causes. 15 years ago when I would sit for a while, 30 minutes, I would have knee pain for a while after I got up. I had that probably for a few years. I said to myself, this is how it is going to be as I get older and play tennis. I have not had that for several years now and believe that it was related to tight rectus femorus muscles. The rectus femorus if the only quad muscles that attached above the hip. It can get short from sitting. In fact, it also bends the pelvis forward, anterior pelvic, and that is a common symptom of aging with our sitting lifestyles. After many years set in place my pelvis went back about 1" at the top when I stretched my rectus femorus. Again, careful doing stretches they could stress your back. The knee has more that one joint system. Think of the patellofemoral joint as separate joint. That joint is one of the most common and earliest locations for arthritis. If things rub in there for too long the cartilage cannot take it. I don't think the arthritis reverses............ Don't take drugs and keep playing tennis. Stop the stress, see a Dr, learn about posture, and see what you can do about it. One last possibility, don't exclude the possibility of infections such a Lyme disease. I started feeling arthritis in the knees in my late 40s. Ice after exercise and heat prior to exercise helped quite a bit. Ice is a great anti-inflammatory. Usually, if I did 15-20 mins or cardio on a bike prior to tennis, it helped immensely. Any low-impact cardio should do. It served to get the synovial fluid flowing in my knees and the endorphins flowing in my brain. Make sure that you are getting a generous amount of omega-3 fatty acids in your diet. Salmon and sardines (particularly with bones) are excellent sources. If you are a vegan, then you might pick up some vegetarian DHA supplements. Alternate sources, tho' not as good as fish sources, would be chia seeds (soaked) and flax seeds (ground). Note that grinding your own flax seeds is much better for you than buying flaxseed meal or flaxseed oil. Light warmup and warm wraps, some made of neoprene. IB and other NSAIDs (aspirin or naproxen) prior to tennis matches can help. Note that an anti-inflammatory dose is normally 1.5x to 2x of the usual pain dose every 6-8 hours. For IB, that would be 400-800 mg several times a day. The gel caps seem to work better than tablets for me. But then you don't really want to make a habit of using these high dosages on a regular basis. NSAIDs, even OTC are not w/o negative side effects. Your knee issue could very likely be arthritis (OA). OA due to wear and tear on the knees is often more common athletes and those who engage in a lot of repetitive motion of the knees. Males under 50 or 55 are more prone to OA than females. After 55, females probably get OA more than males. Note that increased body weight (men & women) will increase the likelihood of OA. 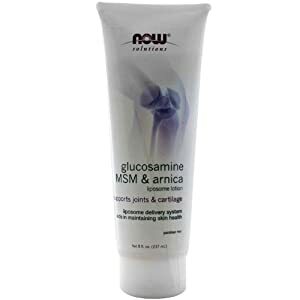 Note that results are mixed for Glucosamine for OA/knee pain. However, there have been a couple of long term studies with Crystalline Glucosamine Sulfate (GS) that have shown positive results. Do not know if any studies show clear positive results with other forms of GS or with Glucosamine HCl. Crystalline GS was developed by RottaPharm (Rotta Research) in Italy. It is sold by prescription by Rotta in much of Europe. In the US is distributed only by WynnPharm and is available OTC (w/o prescription). It is sold under the DONA name. It appears to be available thru Walgreeds and several online sources. I just started using this product very recently so I cannot yet pass along my experience with long-term benefits (cartilage health, OA reduction). However, I believe that I might be deriving some anti-inflammatory benefit at this point. I am using this in conjunction with a Hyaluronic Acid supplement and the following lotion from NOW. I sometimes use this lotion with DMSO for added tissue penetration and MSM production. I've already mentioned some natural "remedies" in post #7. There are other foods and spices/herbs to consider. These can, hopefully, reduce your needs for NSAIDs. Turmeric/curcumin is one of these. Normally, the bioavailablity of turmeric or curcumin is rather poor. Turmeric is usually best assimilated in cooking. Black pepper (or piperine) and lecithin has been shown to improve the availability of turmeric/curcumin. Other oils/fats may work in place of lecithin. Ginger root, holy basil (tulsi), rosemary, and cayenne are probably also helpful for reducing pain & inflammation. Green tea , apple cider vinegar, and tart or dark cherry juice (or cherries) can also provide relief from pain & inflammation. Stiff knees are asking for a few reps of deep knee bends daily or daily- daily, same with any ache. ^ Yup, deep knee bend can also get the synovial fluid flowing. Jumping rope (moderate impact) can help as well. You can use these exercises as part of a cardio workout to, possibly, promote the release of endorphins. Get more cushioned shoes like Asics Gel Resolution 5, Yonex Power Cushion Pro etc. These will absorb much more shock than not-so-much-cushioned shoes. Bending knees and keeping them warm before training. Glucosamine will work, but not instantly, takes couple of weeks at least. You have to take it for several months at a time. Barefoot running (Vibram Fivefingers) will help with knee problems but might cause plantar fasciitis (foot arch problem) if done wrong (not breaking foot in). For tennis I can not recommend these, unless just light practice purposes. When applied prior workout it will heat up the area (in this case knee). You will not feel pain and it also acts as warmup. Works great but don't know how healthy it is. It might hide injuries that can happen during practice. Overweight? Flat feet (over-pronation)? Nadal-style footwork/movement? ... My pain is right on the front of the knee cap, where the patella is. It isn't bad if go down to the squatting position. But when I slightly bend my knee, it is hard to stay in that position. If post-exercise icing, pre-exercise heat, an extended cardio warmup and other countermeasure suggested do not seem to help or, if your condition worsens, seek out medical help. I happened to see an orthopedic doctor for knee pain and stiffness yesterday. It is common cartilage problem and the solution is to strengthen the muscle at the top and side of the knee. He referred me to PT. This morning I asked the cross training class instructor at the gym and he showed me how to use the roller to stretch the leg muscles. I will see what the PT does. Yeah, I do need to drop some weight and I do have flat feet. That is a good reminder. My brother in law had some knee issues and used the roller on his quadriceps which seemed to help. I'll talk to him. Stretches for muscles that are already too long or exercises for muscles that are already strong and might already be out of balance are counter productive. I don't know much about rollers. Are rollers always good for you? What is the tissue? And what is that tissue doing that causes the stiff knee? This needs a Dr to diagnose the injury or condition as there are probably hundreds causes for stiff knees. Also did some floor leg stretches/leg pulls with a tennis ball behind my knees or calf & hamstring... also felt great. Foam rolling can help with tight muscles of the upper and lower leg that might be affecting the knee. Not sure that this should be used on the front of the knee itself tho'. I found a smaller foam roller at Walmart for a mere $10. If you want a firmer roller that is a standard size, it will probably cost $25-40 or so. The (softer) foam roller or tennis balls can be used for myofascial release (MFR) as well. An older tennis ball will work if a softer pressure is needed; use a newer tennis ball is a firmer pressure is needed. Identify areas of the leg (muscles) that seem to be particularly tight. Stay on one area for 3-5 minutes for MF Release. You might try a Search to see what RogueFLIP has said about MFR in past threads. This combination can definitely stress the knees. I believe that both arthritis and runner's knee can result. Other knee problems also possible.